Should the engine suddenly stop or fail to start, check the cause as follows. Also see EMERGENCY CHART. 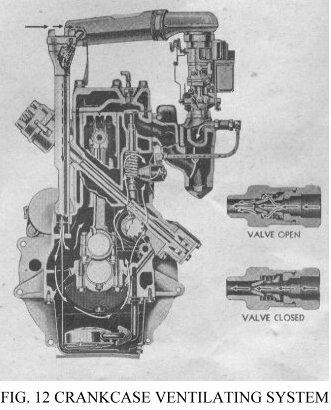 Make sure there is gasoline getting to the carburetor (Note: Should the trouble be traced to the gasoline supply see FUEL SYSTEM) and that the ignition switch is “ON”. Check ignition circuit wiring connections to be sure they are tight and clean. Check that the distributor breaker points are smooth, have a flat contact with each other and are set to the proper gap (.020”). If the points are rough, replace them or temporarily smooth them with a breaker point file. Inspect the distributor cap and rotor for cracks, carbon runners or burned places. If they are found replace the part. See that the current is reaching the distributor breaker points. 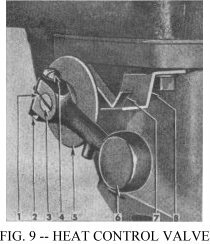 To make this test, turn on the ignition switch, remove the distributor cap and turn the engine until the breaker points are open, then holding one end of a piece of wire on the breaker arm, strike the other end on a clean, unpainted surface of the engine. No flash indicates a poor or open connection between the switch and distributor or an open circuit in the coil. If the wire and connections leading to the coil are in good condition, then an open primary in the coil is apparent and a new coil will be necessary. To test the secondary coil circuit, remove the distributor cap and turn the engine until the breaker points are making contact. Turn “ON” the ignition switch and remove the high tension wire (center wire) from the distributor cap. Hold this wire about one-eighth of an inch from a clean, unpainted surface of the engine, then open and close the breaker points with the finger, giving them a short, snappy break. A fat, flame-coloured spark indicates the coil is in good condition. No spark indicates the secondary winding of the coil is open, while a thin, stringy spark indicates an internally shorted coil or a loose or inoperative condenser. Condenser trouble will also be indicated by badly burned breaker points. Should the test show a thin, stringy spark, check the condenser first. 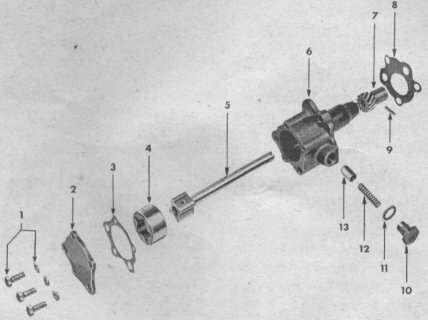 Be sure that the mounting screw is tight and is making a good ground connection to the distributor body and also that the connecting wire to the distributor points is not broken or the connection loose. Should no trouble be found in the condenser mounting or connection, install a new condenser which will localize the difficulty in either the coil or the condenser. No repairs can be made to either the condenser or coil, it being necessary to replace them if inoperative. The manifolding is designed to utilize the exhaust gasses of the engine to provide a quick means of heating the inlet manifold, thereby reducing the length of time the choke must be used after starting a cold engine and making the engine more flexible during the warm up period. The heat control valve, Fig. 9, which controls the amount of exhaust gasses by-passed around the intake manifold insures more complete vaporization of the fuel. This control is fully automatic. The valve shaft should turn freely in the manifold at all times. Note that the thermoplastic spring, No. 7, should be assembled above the metal stop, No. 8. The rubber engine mountings, which are attached to the frame side rail brackets and to the support plate, prevent fore-and-aft motion of the engine, yet allow free sidewise and vertical oscillation which neutralizes vibration at the source. Keep the mountings tight. A loose engine may cause vibration, clutch chatter or high fuel level in the carburetor. The rubber surface of the mountings partially insulates the engine from the frame. 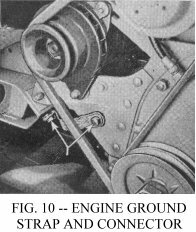 To assure a positive electrical connection between the engine and the frame, a ground strap is provided at the right front engine support under the generator. See Fig. 10. The two attaching screws must be kept tight and the connections clean. A loose or poor connection may result in hard engine starting, low charging rate of the generator or sluggish operation of the starting motor. The oil pump assembly is provided with a pressure relief valve which controls the maximum oil pressure at all speeds. The standard controlled pressure is 35 lps. at 30 mph. and 10 lbs. at the idle speed of 600 rpm. as registered by the dash gauge. Pressure may be adjusted by installing or removing shims between the relief plunger spring and the spring retainer. Add shims to increase the pressure or remove to decrease. 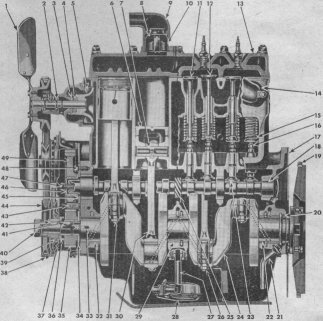 The oil pump drive shaft drives both the pump and the distributor assembly. See Fig. 2. Should it be necessary to remove the oil pump assembly, first remove the distributor cap and carefully note the position of the rotor to allow reinstallation without disturbing the ignition timing. When the pump is installed, use care that the driving key on the end of the distributor shaft is correctly meshed with the slot on the end of the pump shaft. To make the installation without disturbing the ignition timing, the pump gear must be correctly meshed with the camshaft gear to allow mesh of the distributor driving key and slot with the distributor rotor in the original position. Should it be necessary to reset the ignition timing, refer to the previous page. The floating oil intake (No. 28, Fig. 2) is attached to the crankcase with two screws. The construction of the float and screen cause it to remain on top of the oil, preventing the circulation of water and dirt. Once each year remove the float, screen and tube and clean thoroughly with a suitable cleaning fluid. When replacing, place some sealer on the gasket where the tube bears against the engine crankcase. A leak at this point will allow air to enter the oil suction line seriously affecting oil pressure. The crankcase ventilating system provides thorough, positive ventilation which reduces to a minimum the formation of sludge. In operation (see Fgi. 12) clean air flows from the air cleaner through the short connecting tube to the oil filler tube and then through the crankcase and valve compartment to the intake manifold. Any vapours in the crankcase are carried into the manifold and burned. Positive air circulation reduces oil temperatures and the formation of moisture due to condensation. Air flow is controlled at the manifold by the control valve. Be sure there are no air leaks at the tube connection between the air cleaner and oil filler tube, and that the oil filler tube cap gasket is in good condition. Always keep the cap locked securely in place. When tuning the engine of grinding valves, remove the control valve and clean it thoroughly. If this valve is blocked with carbon, the ventilating system will not operate and should the valve fail to seat, it will be impossible to make the engine idle satisfactorily.